Two astronauts aboard the International Space Station (ISS) have completed an Extra Vehicular Activity (EVA) during Wednesday to Remove and Replace (R&R) a failed external computer module. The EVA known as US EVA-26 in the ISS numbering system, began at 1:56 PM GMT and was completed without issue in double time, ending just one hour 36 mins later. On Friday 11 April, an external control computer known as a Multiplexer/Demultiplexer (MDM) failed. An MDM is essentially an electronics unit that sends and receives multiple streams of data, and thus all incoming and outgoing data to and from the ISS is routed to its correct destination via an MDM. 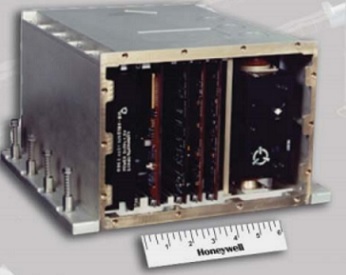 Specifically, it was the EXT-2 MDM which failed, which is a Tier 2 (Local) MDM which is responsible for system-specific control and data processing of multiple external systems, including the Mobile Transporter (MT), Thermal Radiator Rotary Joint (TRRJ), Secondary Electrical Power System (SEPS), Passive Thermal Control System (PTCS), and the Solar Alpha Rotary Joint (SARJ). 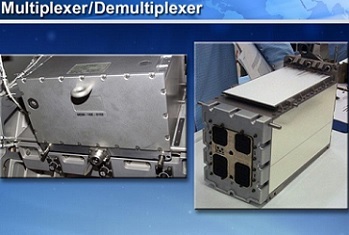 The EXT-2 is one of two EXT MDMs on the S0 Truss, the other being the EXT-1 MDM, which is the primary EXT MDM. 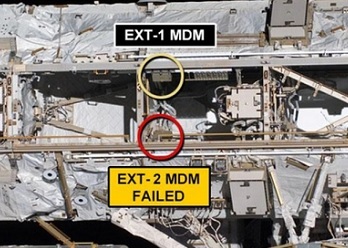 Thus, the EXT-2 MDM is only the back-up EXT MDM, and so its failure does not mean any actual loss of capability for the ISS. However, it does result in a loss of redundancy in the event of an EXT-1 MDM failure. The EXT-2 MDM is located on the S0 Truss, and in terms of physical construct is basically a metal box with space inside it for 16 circuit cards (hence it is known as a size 16 MDM) . Its dimensions are 10.5 x 14.9 x 16.4 inches, and its weight is 50.8 pounds. MDMs are installed via two captive fasteners on their left and right sides, and a center jackscrew to hold the MDM enclosure in its location. All electrical and data connections to the MDM are made via blind mate connectors on the rear of the MDM. Over the past week, many tasks have been completed to prepare the three Extravehicular Mobility Unit (EMU) spacesuits (serial numbers 3005, 3010 and 3011) aboard the ISS, all of which have now had their Fan Pump Separator (FPS) unit replaced, and all of which have had three required water flushes. A full Return to Service (RTS) checkout of the suits was also performed, as well as a validation fit check. 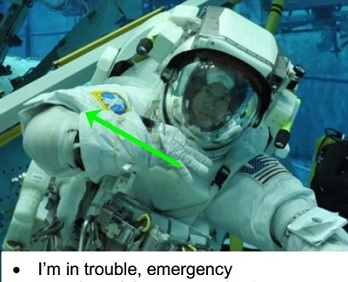 Also, per the EVA-26 overview presentation – available on L2 – the spacewalkers have been provided with a cue card of emergency signals they can use in the event of a problem during their EVA. This relates to lessons learned after the water leak incident with Luca Parmitano’s faulty spacesuit, that resulted in the premature end to EVA-23 last year. The new EMU which arrived on the SpX-3 Dragon is not yet cleared for service and thus will not be used. With regard the spare MDM (which was stored inside the ISS), a problem was identified with the Chotherm material (interstitial material between the MDM and coldplate) being too thin. However, with the SpX-3 Dragon just days away from launching at the time, NASA were able to dispatch a T-38 jet to retrieve some new material from the manufacturer. After it was flown to the launch site, it was added as a late-load item into Dragon. Additionally, the crew also replaced a circuit card inside the MDM with an Enhanced Input/Output Control Unit (EIOCU) card, which features more up-to-date boot software, and which was scavenged from a spare Payload (PL) MDM aboard the ISS. Using the MDM On-Orbit Tester (MOOT), the crew then set the MDM to boot in Diagnostic mode, which will allow for EXT MDM software to be loaded onto the PL MDM EIOCU card once the MDM is installed and powered on. The crew also performed a full functionality test on the MDM using the MOOT. The EVA was conducted by astronauts Rick Mastracchio, who was designated as EV-2 and wearing suit 3011, and Steve Swanson, who was designated EV-1 and wearing suit 3005. Both astronauts have previous EVA experience, with Mastracchio’s most recent EVA being conducted in December 2013, and Swanson’s most recent EVA being conducted during the STS-119 mission in March 2009. The EVA procedures themselves were extremely simple, and planned to last only 2.5 hours. 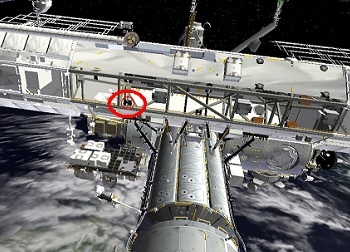 Once they egressed the Quest airlock (A/L), both crewmembers began 40 minutes of standard setup work that includes translating to the MDM R&R worksite at the Starboard-Nadir corner of the S0 Truss. Once set-up at the worksite, the planned hour-long task of replacing the EXT-2 MDM began, with the first step being for EV-1 to use his Pistol Grip Tool (PGT) to release two secondary bolts on the failed MDM, with 7 to 14 turns expected on each. The center jacking bolt was released, which required nearly 32 turns. A handling aid known as a scoop” was then attached to the failed MDM, whereupon it was removed from its coldplate on the S0 Truss. A visual inspection of the coldplate and blind-mate connectors was then performed, in order to check for any Micro Meteoroid Orbital Debris (MMOD) strikes, debris, or residual Chotherm insulation material. The spare MDM was then installed onto the coldplate on the S0 Truss, using the same procedure used to remove the failed MDM – that was, driving the center primary bolt, and then the two secondary bolts. At this point, the primary objective of the EVA was complete, way ahead of schedule, and the two spacewalkers eventually conducted cleanup and ingress tasks, prior to translating back to and re-pressurising the A/L, bringing with them the failed MDM, which can be returned to serviceable status via on-orbit replacement of its faulty internal circuit cards. 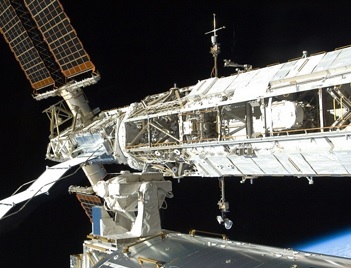 Only one task that was classed as a get-ahead, was the cutting of a wire lanyard that was interfering with robotic access to the Secondary Power Distribution Assembly (SPDA) door atop the S0 Truss. This was completed during the post-MDM installation tasks. The SPDA is a collection of Remote Power Control Module (RPCM) circuit breakers contained behind two doors, that can be slid open and closed via the driving of two bolts, which can be accomplished manually via a PGT, or robotically via the Special Purpose Dextrous Manipulator (SPDM) “Dextre”. 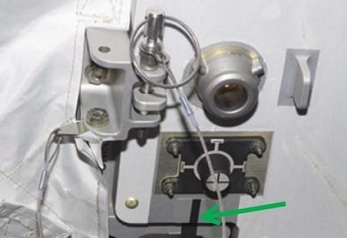 However, when the SPDM attempted to drive the two door bolts for the first time last June, in order to robotically R&R an RPCM, a restraint lanyard for a PIP pin near the bolt was causing interference, and thus the spacewalkers cut and removed the unnecessary lanyards and PIP pins from both doors. This was another relatively simple task that involved cutting the lanyard with some EVA scissors, and then removing the PIP pin, followed by opening and closing the SPDA door using the PGT. This procedure was repeated for both doors, with one of the doors requiring brute force to open. The MDM itself has already been powered up and is appearing to be in good shape.